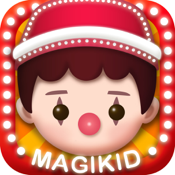 Magikid Circus is a dramatic digital toy for budding story-tellers and explorers. Travel around the world and create unique plays in each location. No two stories are ever the same in Magikid Circus. Help your kid celebrate diversity and learn about the international cultures. Magikid Circus puts the kids in control by making them the writer, director and actor in their very own play - encouraging story-telling and language skills. It’s time to join the Circus! This digital toy is easy to pick up and play. Huge library of interactive characters, props, and backgrounds. Pull-string controls are easy to use. Child-lock keeps kids out of the parent’s area. Regularly updated with more toys and tools. Universal app, works on all supported iOS devices. 1. Choose your background, characters, and props. 3. Share it and watch other kids’ plays! Magikid Circus helps to promote story-telling skills in young learners. They are introduced to essential concepts such as setting, scenes, characters and narration in a fun environment. We are a digital game workshop that develops educational apps for young learners. We combine games, music, and art to create a Magikid world that teaches important skills to kids. Our apps have been featured in Best New Apps and the Kids & Education categories. Magikid-Discover The Magic In Every Kid!